In our culture, family gatherings, celebrations, and catching up with friends usually involves FOOD! Many times, it’s the kind of food that will leave you feeling bloated and inflamed. Celebrating with a feast has its place – we even read several places in God’s Word that celebrations coincide with feasting. But sometimes, it can make maintaining, and especially starting a healthy lifestyle, difficult. For those recovering from a food or sugar addiction, it can be stressful and cause anxiety. What if we changed our focus and found some other ways to celebrate, other ways to fellowship, or other ways to spend time with others? I’m going to challenge you to switch things up a bit, and sometimes enjoy connecting with family and friends in ways that don’t involve food. After reading this list, we’d love to hear how you connect with others apart from food. 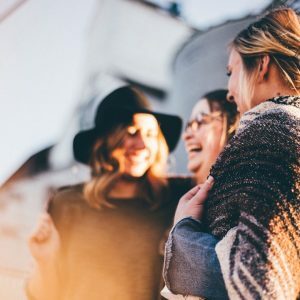 Here are 7 ways that we think can make a big difference in how you connect with others, plus will give you some back pocket ideas the next time the need arises. Connecting can be even more meaningful when nature is involved! The fresh air and beautiful scenery lend themselves to stress relief and an overall feeling of wellness. If you don’t have trails near you, a walk through the neighborhood is just as good! Removing our eyes from the screens and short-distance sights to which we are so accustomed can bring enormous pleasure and comfort to our bodies, and our minds. Getting a little exercise while chatting with your bestie? Priceless. Go for a country drive. There’s something about riding in a car that helps us initiate deep conversation. Perhaps it’s the captive audience, or lack of external distractions, but I’m sure the key to world peace will come from a car convo! You don’t have to go far, but a meandering route through a nice neighborhood or some country road will leave you, and your car mates, time and room to converse. Play a favorite sport together. When you include endorphins in a moment of connection with another person, you’ve got magic. Endorphins put us in a state of calm and make our brains more receptive to what we are seeing and hearing. Staying active alongside your friends will not only boost your individual wellness, but also the wellness of your relationships. No need to spend money! You and your girlfriends can dream together about that fabulous $500 dress you’ll never buy. Go ahead, try it on and get a picture to share with us! How can laughter and memories not follow suit? Whether it’s the humane society, visiting with residents of a nursing home, or working in a local soup kitchen – doing good together brings people closer. Nothing feels better than selflessly giving of ourselves, and when we involve others, a sweet time affecting our world on a deeper level with those we care about is created. Wine and canvas parties are all the rage in many parts of the country. Get your squad together and let an expert turn you into Picasso. OR save some money and have a coloring party. yes, you read that right! Purchase colored pencils and some grown up coloring books featuring beautiful designs, and see what happens when you connect in conversation during this stress-relieving activity. Chances are, if you grew up in the 70’s or 80’s you spent at least part of your weekend at the local skating rink. Not only is skating great exercise, but the nostalgia it brings can do a lot for stress levels as you roll yourself back to a simpler time. It’s also an activity you can do while socializing and having great conversations, much like walking. Only faster! Not to mention a bit more dangerous if it’s been awhile, so maybe invest in a set of kneepads first. Be adventurous! This is only a small list. Our social lives don’t always have to involve food. Sometimes dinner out with friends just won’t fit in the budget, sometimes we know our resolve to say no to the dessert menu will be weak. Whatever the reason, find new ways to strengthen your relationships that involve creativity, movement, giving, and FUN! What kinds of activities do you participate in with friends and family that doesn’t involve food?